A young girl’s parents can’t figure out what is troubling their daughter about an upcoming move in this text-dense second picture book by Kohlman (Are Your Ears on Your Knees, 2012). 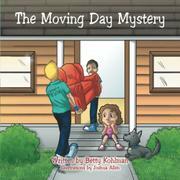 Becky and her parents are preparing for a move from the city to a new house in the suburbs. Over the months, they have watched it grow from foundation to roof. While Becky seems to enjoy the process, as the move approaches, she becomes quiet and troubled, and her parents cannot solve the mystery of Becky’s unhappiness. Adult readers will guess right away: Becky is worried that her loose tooth won’t fall out in time for the tooth fairy to find it! But young readers may be just as confused as Becky’s parents since the reason for her anxiety isn’t easily determined. Allen’s colorful and approachable cartoon illustrations—and his very convincing image of Becky’s worried expression—are eye-catching. The sense that Becky is moving from a dense urban area is clear only in the text; she appears to be moving from one middle-class house in an all-white neighborhood to another. Additionally, the first image feels more like an architecture sketch than an illustration for children. Kohlman’s text has simple enough sentences that newly independent readers won’t be stumped by vocabulary, but the sheer number of words per page may intimidate some young readers. Because the story is told from the adult perspective rather than Becky’s, it may be hard for young readers to engage with the text even if they are concerned about what is making Becky unhappy. Still, there are plenty of fun moments here: The growth of the house and Becky’s observations are clever (“another time the kitchen cabinets were sitting on the living room floor. Becky thought that was funny”). Readers who are afraid of leaving behind an old house may find comfort in the solution to Becky’s problem. A simple mystery about a move and a loose tooth with attractive illustrations, though accompanied by thick blocks of text.